Fantastic News! The International Campaign to Abolish Nuclear Weapons – ICAN – of which the Peace & Justice Centre is an affiliate – has today been awarded the Nobel Peace Prize! 53 Countries have signed the Treaty to Prohibit Nuclear Weapons. When 50 Ratify it, it will be International Law. To date the UK, US, Russia and other nuclear weapons states have refused to sign and in fact actively opposed the treaty. From experiencing campaigning most people in Britain didn’t even know about it. The award of the Peace Prize will massively boost awareness of this historic campaign. This is the beginning of the end of nuclear weapons. At last, after decades of campaigning we can, perhaps, see the light at the end of the tunnel. It should now be crystal clear that the only way to prevent any future nuclear war is to ban them. But make no mistake, the countries that possess nuclear weapons, and those that want them, will not relinquish them without a fight. This comes at a time when, with the crisis in North Korea, tensions between the US and Russia, tensions with China, and, most importantly the uncertainty of Donald Trump, in the White House, with his finger hovering over that nuclear button at every moment, the risk of nuclear war is greater than at any time since the Cold War. Trump has repeatedly threatened the use of nuclear weapons. As we have said before, This is Not OK. It is vital that people everywhere understand the catastrophic humanitarian consequences of any use of nuclear weapons. and that banning them is the only way to insure security against them. That has been the core message of ICAN for ten years. The use of 50 or even just 10 nuclear weapons – of the tens of thousands still in existence worldwide would cause a nuclear winter due to the cloud of radioactive dust that would fill the air over half the world and would cause a global famine leading to the deaths of a Billion people. That’s 1/7 of the world’s population. But we can prevent this. In its Statement on Nobel Peace Prize 2017 ICAN has honoured the millions of people who have campaigned for nuclear disarmament for generations. ” It is a great honour to have been awarded the Nobel Peace Prize for 2017 in recognition of our role in achieving the Treaty on the Prohibition of Nuclear Weapons. This historic agreement, adopted on 7 July with the backing of 122 nations, offers a powerful, much-needed alternative to a world in which threats of mass destruction are allowed to prevail and, indeed, are escalating. Please spread the word of this momentous ocassion and get involved. There are lots of ways to do so. 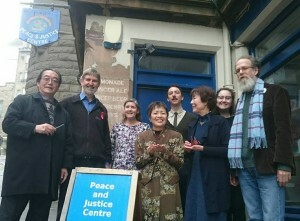 Some of the survivors of the Hiroshima bomb visited the Peace & Justice Centre just last week, and others visited earlier this year. We heard their stories and told them about our Origami Cranes Project which aims to make 140,000 origami peace cranes to remember Hiroshima and give the message that this must Never happen again. All are invited to get involved in this as one way to deepen the opposition to nuclear weapons. Find out more about the project, info on the next workshop and how you can contribute to the project here. The Peace & Justice Centre is proud to be an affiliate of ICAN. We have been campaigning in Scotland for nuclear disarmament since 1980.